Yahtzee társasjáték - Magyarország társasjáték keresője! A társasjáték érték! A Yahtzee egy kiváló társasjáték, 2 - 10 játékos részére, az átlagos játékidő rövid, csak 30 perc. A társas elsősorban gyerekeknek készült, akár már 6 éves kortól is játszható. A játékmenet erősen épít a kollekció gyűjtés, a ceruza-papír, a kockadobás és a merj és nyerj mechanizmusokra. 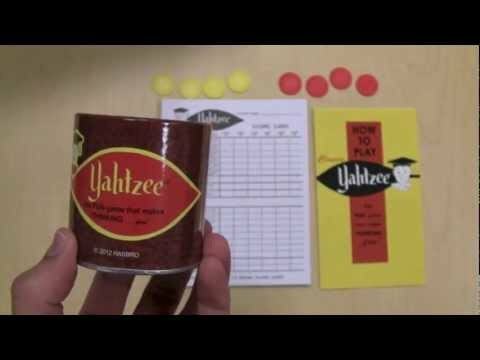 Yahtzee is a classic dice game played with 5 dice. Each player's turn consists of rolling the dice up to 3 times in hope of making 1 of 13 categories. Examples of categories are 3 of a kind, 4 of a kind, straight, full house, etc. Each player tries to fill in a score for each category, but this is not always possible. When all players have entered a score or a zero for all 13 categories, the game ends and total scores are compared. The traditional (public domain) game Yacht predates the trademarked game, and has slightly different scoring. There are four basic scoring difference between the tradition game Yacht and Yahtzee. They are: 1) Yacht has no Three of a Kind category, 2) there are no bonuses in Yacht, 3) there are no Joker rules in Yacht, and 4) the Full House category is scored as the sum of the dice. The other scoring rules are identical between the two games. Travel versions of the game use a device that keeps the dice captured within compartments of a plastic box and allows players to "lock" a particular die between rolls.